This magnificent miniature, seeking to reproduce a late eighteenth century miniature from Bijapur in Deccan, represents a young Yogini figure against a lush green dense background consisting of flowering and non-flowering shrubs, multi-coloured distant cypresses and some architectural units conceived on the Islamic lines. As regards the figure’s iconographic features, character of the background and the type of architecture the painting is characteristic to Deccani art school of late seventeenth or early eighteenth century. The style of her crest – typical of Islamic princes and princesses, gems’ studded hair-ornaments and those for ears and neck, especially the close clinging necklaces made of rubies and pearls, the form of her chakdara jama – the upper gown with sharp angular ends and richly embroidered ‘dupatta’ – sash, and waist-band, her bejeweled shoes and even her facial features not only reveal that she is from Islamic order but also her royal links. Not merely that female ascetics, the Yoginis in the Shaivite lines, or those pursuing Sufi cult under Islamic Order, have been a popular theme of Deccani miniatures, even in the life of Deccan, both in Shaivite and Islamic Orders, Yoginis had a massive and early presence, from around the sixteenth century, if not earlier. The Sufi saints apart, allusions to Yoginis begin appearing in texts from around the early part of the eighteenth century. A number of Deccani miniatures from seventeenth-eighteenth century have Yoginis as their theme. Though with certain restrictions, women in Islamic Order were allowed to take to Sufi asceticism. Interestingly, despite that they belonged to widely different sectarian lines both, Sufi ascetics as well as Shaivite Yoginis, commanded equal respect from all, Hindu or Musalman. Hindus usually revered female ascetics in Islamic line as Sati Maa or as Chacha Bi. Both were believed to have spiritual powers to the extent of transforming iron into gold or summoning any power of nature to appear before her and do as commanded. Further, irrespective of what the male ascetics in a particular sectarian line were clad in, Yoginis of both sects were represented as wearing rich costumes, expensive jewellery and shoes embedded with precious, semi-precious stones. They wore a tight pajama – trousers, an elongated jama, a long ‘dupatta’ and richly embroidered waist-band. They have knotted, more often matted, upwards raised hair and carried in their hands either a morachhala or trident, or a lyre. This Yogini figure has a ‘vina’ – lyre, in her hands, has upwards raised hair partly knotted, partly braided and partly let loose on her shoulder and is roaming in the forest. In one way, that is, taking into consideration their rich costumes, expensive jewellery, gems’ studded shoes etc., these Yoginis, more particularly those from Islamic Order as the one represented in this brilliant miniature, seem to have royal descent, and in other way, in view of their matted hair, lyre in hands and the forest surroundings where they roam, they are for certain the ascetics – Yoginis. Though from different sources, Yoginis of both lines have an alike cult of rich costumes and overall splendour. Those in Shaivite line grew out of the initial Devadasi cult under which they were offered to the deity as a splendidly bejeweled bride, and hence, all this splendour. Those in Islamic line were essentially of the royal descent taking to Sufism sometimes for the life but more often for a period till the desired goal was accomplished. However, an authentic female ascetic in Islamic line was ordained to confine to a Kankhah – a Sufi-saint’s seat with which she associated herself. It was only a Yogini in Shaivite line who roamed around in the forest. This female ascetic is essentially one from a royal house and is from Islamic Order though unlike one from Sufi line she has been portrayed as roaming around in the forest like a Shaivite Yogini. In consideration of such self contradictory position some scholars feel that the earlier eighteenth century miniature and correspondingly this masterpiece that reproduces that earlier miniature, is the imaginary portrait of the princess Badr-e-Munir who had turned into a legend of love in Deccan. As writes Mir Hasan Dehlavi in late eighteenth century in his Mathanavi, Sahrul Bayan, one night the princess had a dream that her lover was taken as captive in some unknown place. She was so filled with sorrow that she decided to commit suicide. However, her friend Najmunnisa consoled her and advised her to devote her life in his search instead of ending it. She said that she could go out in a Yogini’s garb. 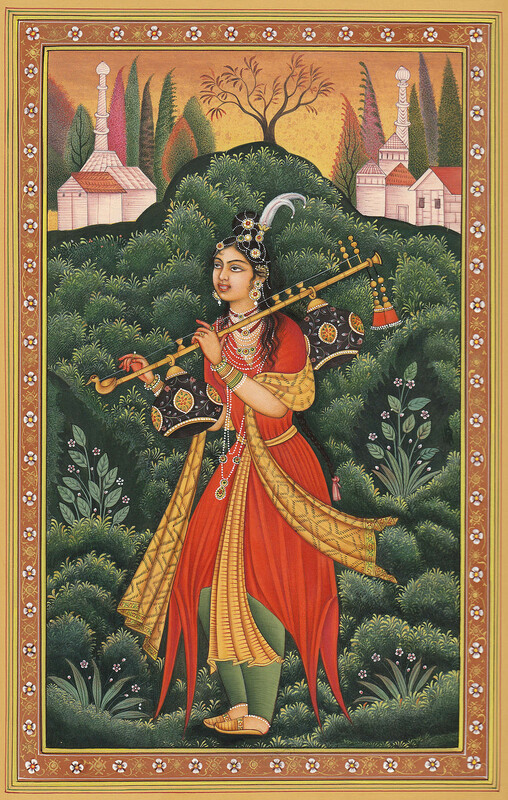 Badr-e-Munir did as her friend advised and with a lyre in hand, body smeared with ashes, forehead with sandal paste and costuming and bejeweling as was conventional for a Yogini she left the palace and wandered from one place to other in search of her lover. This Yogini figure, abounding in rare splendour as has a princess around her, might be seen as representing the textual image of Badr-e-Munir of the Mathanavi of Mir Hasan Dehlavi.